By clicking on the titles below, you may access the mandate and current activities of the selected Committee. Participating employers and bargaining agents take joint ownership of broad labour relations issues and develop collaborative solutions to workplace problems through the auspices of the National Joint Council. Employers and bargaining agents have agreed that the National Joint Council is the "Forum of Choice". To share information; to consult on workplace policies; to co-develop directives which provide public service-wide benefits. The Executive Committee is empowered to act on behalf of the Council in administering the activities of Council during the intervals between the Council's quarterly meetings. 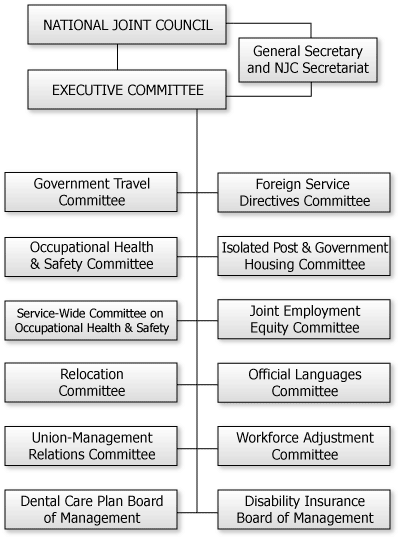 Executive Committee decisions are subject to the formal ratification by Council when they are reported at the next regular meeting of the Council. Council may also delegate its decision-making authority to the Executive Committee to facilitate timely and effective action. The General Secretary acts under the general direction of the Executive Committee and is not a member of Council or any Council committees of the NJC. The Employer and Bargaining Agent sides alternately nominate the General Secretary who heads the NJC Secretariat for a five-year term. The NJC Secretariat, operating under the general direction of the General Secretary, offers administrative and professional support to Council and its component bodies.